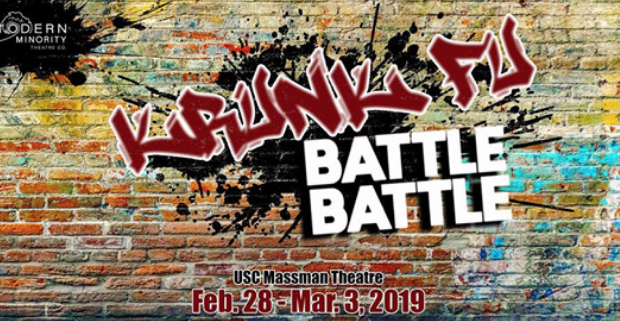 Modern Minority invites you to its inaugural production, “Krunk Fu Battle Battle,” at Massman Theatre, USC School of Dramatic Arts, 1029 Childs Way, Los Angeles. “The Karate Kid” meets “Dance Battles” in this multicultural hip-hop musical by Qui Nguyen, Marc Macalintal, and Beau Sia. Showtimes: Friday, March 1, at 11 p.m.; Saturday, March 2, at 12:30 a.m.; Sunday, March 3, at 2:30 p.m.
Tickets are free (suggested donation $5) and can be reserved online at https://www.eventbrite.com/e/krunk-fu-battle-battle-tickets. If a show is sold out, you are encouraged to show up anyway and get on the waitlist.